November 5-9, 2014 – Live Event: Big E and Kofi Kingston defeated Luke Harper and Erick Rowan. November 28, 2014 – SmackDown: The New Day (Big E, Kofi Kingston and Xavier Woods) defeated Curtis Axel and Slater Gator (Heath Slater and Titus O’Neil). December 1, 2014 – RAW: The Uso’s defeated Big E and Kofi Kingston w/ Xavier Woods, Adam Rose and The Bunny, Goldust and Stardust and Cesaro and Tyson Kidd in a tag team turmoil match to become #1 contender for the tag titles. December 8, 2014 – RAW: Kofi Kingston w/ The New Day defeated Stardust w Goldust. December 15, 2014 – RAW: Big E and Xavier Woods w/ Kofi Kingston defeated Goldust and Stardust. December 12, 2014 – SmackDown: Big E w New Day defeated Goldust w Stardust. December 14, 2014 – TLC Kickoff: Big E and Kofi Kingston w/ Xavier Woods defeated Goldust and Stardust. December 16, 2014 – Main Event: Kofi Kingston and Xavier Woods w/ Big E defeated Cesaro and Tyson Kidd w/ Natalya. December 23, 2014 – Main Event: Big E w/ The New Day defeated Stardust w Goldust. January 5, 2015 – RAW: Big E w/ The New Day defeated Adam Rose by disqualification. January 9, 2015 – SmackDown: Big E w/ The New Day defeated Adam Rose w/ Cesaro and Tyson Kidd. January 12, 2015 – RAW: Kofi Kingston and Xavier Woods w/ Big E defeated Cesaro and Tyson Kidd w/ Natalya. January 13, 2015 – Main Event: The New Day (Big E, Kofi Kingston and Xavier Woods) defeated Adam Rose, Cesaro and Tyson Kidd. January 19, 2015 – RAW: Big E and Kofi Kingston w/ Xavier Woods defeated Cesaro and Tyson Kidd w/ Natalya. January 20, 2015 – Main Event: Kofi Kingston w New Day defeated Tyson Kidd w Adam Rose, Cesaro and Natalya. January 25, 2015 – Royal Rumble Kickoff: Cesaro and Tyson Kidd w/ Natalya defeated Big E and Kofi Kingston w/ Xavier Woods. Kofi Kingston and Big E were in the royal rumble match won by Roman Reigns. January 31, 2015 – Main Event: Big E and Kofi Kingston w/ Xavier Woods defeated Damien Mizdow and The Miz. February 7, 2015 – Main Event: Cesaro and Tyson Kidd w/ Natalya defeated Big E and Kofi Kingston w/ Xavier Woods. February 16, 2015 – RAW: Kofi Kingston and Xavier Woods w/ Big E defeated Goldust and Stardust. February 27, 2015 – Superstars: Luke Harper defeated Kofi Kingston w/ The New Day. 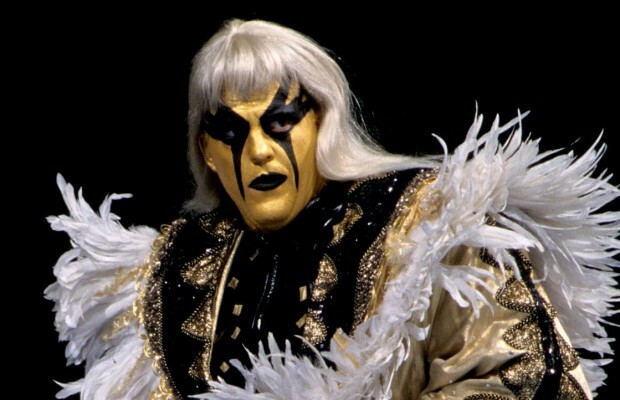 February 28, 2015 – Main Event: Stardust defeated Kofi Kingston. March 5, 2015 – SmackDown: Big E and Kofi Kingston w/ Xavier Woods defeated Damien Mizdow and The Miz. March 12, 2015 – SmackDown: Los Matadores, Cesaro and Tyson Kidd w El Torito and Natalya defeated The Uso’s, Kofi Kingston and Xavier Woods w/ Big E and Xavier Woods. March 16, 2015 – RAW: WWE tag team champions Cesaro and Tyson Kidd w/ Natalya defeated Big E and Kofi Kingston w/ Xavier Woods in a non-title match. March 27, 2015 – Superstars: Kofi Kingston and Xavier Woods w/ Big E defeated The Ascension. March 29, 2015 – WrestleMania Kickoff: The New Day were in the Andre The Giant Memorial battle royal won by The Big Show. WWE tag team champions Cesaro and Tyson Kidd w/ Natalya defeated The Uso’s w Naomi, Los Matadores w El Torito and Big E and Kofi Kingston w/ Xavier Woods in a 4-way tag team match to retain the titles. March 30, 2015 – RAW: The Lucha Dragons, Big E and Kofi Kingston w/ Xavier Woods defeated The Ascension, Cesaro and Tyson Kidd w/ Natalya. April 4, 2015 – Main Event: The Prime Time Players defeated Xavier Woods and Big E w/ Kofi Kingston in a dark match. April 6, 2015 – RAW: The Lucha Dragons defeated Big E and Xavier Woods w/ Kofi Kingston. April 9, 2015 – SmackDown: Finn Balor defeated Xavier Woods in a dark match. Cesaro and Tyson Kidd w/ Natalya defeated WWE tag team champions Kofi Kingston and Big E w/ Xavier Woods in a non-title match. April 16, 2015 – SmackDown: WWE tag team champions Big E and Kofi Kingston w/ Xavier Woods defeated Los Matadores w El Torito in a non-title match. April 20, 2015 – RAW: Big E and Kofi Kingston w/ Xavier Woods defeated The Lucha Dragons by count-out to become #1 contenders for the tag team titles. April 23, 2015 – SmackDown: Kofi Kingston w New Day defeated Cesaro. April 26, 2015 – Extreme Rules: Big E and Kofi Kingston w/ Xavier Woods defeated Cesaro and Tyson Kidd w/ Natalya to win the tag team titles. April 30, 2015 – SmackDown: Cesaro and Tyson Kidd defeated WWE tag team champions Big E and Kofi Kingston w/ Xavier Woods by disqualification. The New Day retains. May 4, 2015 – RAW: The New Day (Big E, Kofi Kingston and Xavier Woods) defeated Randy Orton and Roman Reigns in a handicap match. May 7, 2015 – SmackDown: The New Day (Big E, Kofi Kingston and Xavier Woods) defeated Cesaro, Ryback and Tyson Kidd. May 11, 2015 – RAW: Cesaro w/ Tyson Kidd and Natalya defeated Big E w/ The New Day. May 12, 2015 – SmackDown: Tyson Kidd w/ Cesaro defeated Kofi Kingston w/ The New Day. May 17, 2015 – Payback: WWE tag team champions Big E and Kofi Kingston defeated Cesaro and Tyson Kidd in a best 2 out of 3 falls match to retain. May 18, 2015 – RAW: Cesaro and Tyson Kidd defeated WWE tag team champions Big E and Kofi Kingston w/ Xavier Woods by disqualification. The New Day retains. May 22, 2015 – Main Event: Big E and Xavier Woods w/ Kofi Kingston defeated The Prime Time Players. May 25, 2015 – RAW: The New Day defeated The Ascension, The Lucha Dragons, The Prime Time Players, Los Matadores and Cesaro by disqualification in a handicap match. May 31, 2015 – Elimination Chamber: WWE tag team champions Big E, Kofi Kingston and Xavier Woods defeated Los Matadores, The Prime Time Players, The Lucha Dragons, The Ascension and Cesaro and Tyson Kidd in a elimination chamber match to retain the titles. June 1, 2015 – SmackDown: Dolph Ziggler defeated Kofi Kingston w/ The New Day. Dolph Ziggler and The Prime Time Players defeated The New Day. June 4, 2015 – SmackDown: Neville defeated Kofi Kingston w/ The New Day. June 8, 2015 – RAW: Roman Reigns defeated Kofi Kingston w/ The New Day. June 11, 2015 – SmackDown: Neville, Randy Orton and Roman Reigns defeated Kane, Kofi Kingston and Sheamus w/ Big E and Kofi Kingston by disqualification. June 14, 2015 – Money in the Bank: Kofi Kingston was in the money in the bank match won by Sheamus. The Prime Time Players defeated Big E and Xavier Woods to win the tag team titles. June 15, 2015 – RAW: Neville and The Prime Time Players defeated The New Day. June 22, 2015 – RAW: Neville defeated Kofi Kingston w/ The New Day. June 25, 2015 – SmackDown: The Lucha Dragons and The Prime Time Players defeated Bo Dallas, Big E, Kofi Kingston and Xavier Woods. June 29, 2015 – RAW: The Lucha Dragons and The Prime Time Players defeated Bo Dallas, Big E, Kofi Kingston and Xavier Woods. July 4, 2015 – WWE Live From Tokyo: The Beast In The East: The Lucha Dragons defeated Big E and Xavier Woods in a dark match. Brock Lesnar defeated Kofi Kingston. July 6, 2015 – RAW: Big E and Kofi Kingston w/ Xavier Woods defeated The Lucha Dragons. July 9, 2015 – SmackDown: Titus O’Neil w Darren Young defeated Big E w/ The New Day. July 13, 2015 – RAW: Mark Henry and The Prime Time Players (Darren Young and Titus O’Neil) defeated The New Day (Big E, Kofi Kingston and Xavier Woods). July 16, 2015 – SmackDown: Big E and Kofi Kingston w/ Xavier Woods defeated The Lucha Dragons. July 19, 2015 – Battleground: WWE tag team champions The Prime Time Players defeated Big E and Kofi Kingston w/ Xavier Woods to retain the titles. July 25, 2015 – Main Event: Big E and Kofi Kingston w/ Xavier Woods defeated The Lucha Dragons. July 28, 2015 – SmackDown: Los Matadores and The Lucha Dragons w El Torito defeated The Ascension, Big E and Kofi Kingston w/ Xavier Woods. August 3, 2015 – RAW: The Ascension, Big E and Kofi Kingston w/ Xavier Woods defeated Los Matadores and The Lucha Dragons w El Torito. August 6, 2015 – SmackDown: Mark Henry and The Prime Time Players (Darren Young and Titus O’Neil) defeated The New Day (Big E, Kofi Kingston and Xavier Woods). August 10, 2015 – RAW: Big E and Kofi Kingston w/ Xavier Woods defeated Los Matadores w El Torito. August 13, 2015 – SmackDown: The Prime Time Players defeated Big E and Xavier Woods and Kofi Kingston. August 17, 2015 – RAW: The Lucha Dragons and The Prime Time Players defeated Los Matadores, Big E and Kofi Kingston w/ Xavier Woods and El Torito. August 20, 2015 – SmackDown: The New Day (Big E, Kofi Kingston and Xavier Woods) defeated Los Matadores (Diego and Fernando) and El Torito. August 23, 2015 – SummerSlam: Big E and Kofi Kingston w/ Xavier Woods defeated The Prime Time Players, The Lucha Dragons and Los Matodores in a 4-way tag team match to win the tag team titles. August 24, 2015 – RAW: WWE tag team champions Big E and Kofi Kingston w/ Xavier Woods defeated The Lucha Dragons in a non-title match. August 31, 2015 – RAW: The Dudley Boyz (Bubba Ray Dudley and D-Von Dudley) defeated The New Day (Big E and Kofi Kingston) w/ Xavier Woods in a non-title match. September 3, 2015 – RAW: Dean Ambrose and Roman Reigns defeated WWE tag team champions Big E and Kofi Kingston w/ Xavier Woods by DQ in a non-title match. September 7, 2015 – RAW: John Cena and The Prime Time Players defeated Seth Rollins, Kofi Kingston and Big E w/ Xavier Woods. September 10, 2015 – SmackDown: Dean Ambrose, Jimmy Uso and Roman Reigns vs. The New Day (Big E, Kofi Kingston and Xavier Woods) ended in a no contest. September 14, 2015 – RAW: WWE tag team champions Big E and Kofi Kingston w/ Xavier Woods defeated The Prime Time Players to retain the titles. September 17, 2015 – SmackDown: Kofi Kingston w/ Big E and Xavier Woods defeated D-Von Dudley w/ Bubba Ray Dudley. September 20, 2015 – Night of Champions: The Dudley Boyz defeated WWE tag team champions Big E and Kofi Kingston w/ Xavier Woods by disqualification. 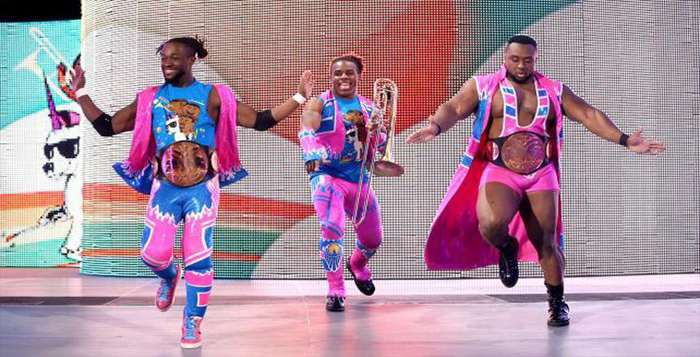 The New Day retains the titles. September 21, 2015 – RAW: Rusev and The New Day (Big E and Kofi Kingston) w/ Xavier Woods defeated Dolph Ziggler and The Dudley Boyz (Bubba Ray Dudley and D-Von Dudley). September 24, 2015 – SmackDown: The New Day (Big E, Kofi Kingston and Xavier Woods) defeated Neville and The Lucha Dragons (Kalisto and Sin Cara). September 28, 2015 – RAW: The New Day (Big E, Kofi Kingston and Xavier Woods) defeated John Cena and The Dudley Boyz (Bubba Ray Dudley and D-Von Dudley) w/ Xavier Woods. October 1, 2015 – SmackDown: Kane and The Dudley Boyz (Bubba Ray Dudley and D-Von Dudley) defeated Seth Rollins and The New Day (Big E and Kofi Kingston) w/ Xavier Woods. October 3, 2015 – WWE Live From MSG: Lesnar vs. Big Show: The Dudley Boyz defeated WWE tag team champions Big E and Kofi Kingston w/ Xavier Woods by disqualification. The New Day retains the titles. October 12, 2015 – RAW: WWE tag team champions Kofi Kingston and Big E w/ Xavier Woods defeated Randy Orton and Dean Ambrose in a non-title match. October 15, 2015 – SmackDown: Dean Ambrose and The Dudley Boyz (Bubba Ray Dudley and D-Von Dudley) defeated The New Day (Big E, Kofi Kingston and Xavier Woods) by disqualification. October 19, 2015 – RAW: The New Day (Big E, Kofi Kingston and Xavier Woods) defeated John Cena and The Dudley Boyz (Bubba Ray Dudley and D-Von Dudley). October 22, 2015 – SmackDown: Dean Ambrose and Roman Reigns defeated WWE tag team champions Big E and Kofi Kingston in a non-title match. October 25, 2015 – Hell in a Cell: WWE tag team champions Kofi Kingston and Big E defeated The Dudley Boyz to retain the tag team titles. October 26, 2015 – RAW: Roman Reigns defeated Kofi Kingston w/ Big E. Dolph Ziggler defeated Big E w/ Kofi Kingston. November 30, 2015 – RAW: The League of Nations and the WWE tag team champions the New Day defeated Roman Reigns, Dean Ambrose, and the Usos in a 7-on-4 handicap, tag team match. December 4, 2015 – Live Event: WWE tag team champions Big E and Kofi Kingston defeated The Dudley Boyz and The Lucha Dragons in a 3-way tag team match to retain the titles. December 21, 2015 – RAW: The Usos defeated the WWE tag team champions the New Day in a 3-on-2 handicap tag team match. December 28, 2015 – RAW: Big E defeated Sin Cara. January 4, 2016 – RAW: WWE tag team champions The New Day defeated The Dudley Boyz and Kalisto. January 7, 2016 – SmackDown: Dolph Ziggler, Neville, Goldust and R-Truth defeated The Miz and the WWE tag team champions the New Day in an 8-man tag team match. January 24, 2016 – Royal Rumble: WWE tag team champions the New Day defeated the Usos to retain the title. January 28, 2016 – SmackDown: The Usos, Dolph Ziggler and Titus O’Neil defeated WWE tag team champions the New Day and the Miz in an 8-man tag team match. February 15, 2016 – RAW: Big E defeated Mark Henry. March 3, 2016 – SmackDown: AJ Styles defeated Kofi Kingston. March 12, 2016 – Roadblock: WWE tag team champions the New Day defeated King Barrett and Sheamus to retain the titles. March 14, 2016 – RAW: WWE tag team champions the New Day defeated Rusev and Alberto Del Rio to retain the titles. March 17, 2016 – SmackDown: Kofi Kingston defeated King Barrett. March 21, 2016 – RAW: Big E defeated Rusev. March 24, 2016 – SmackDown: Sheamus defeated Kofi Kingston. March 28, 2016 – RAW: Kofi Kingston defeated Alberto Del Rio. April 3, 2016 – WrestleMania 32: League of Nations defeat WWE tag team champions the New Day in a 6-man tag team non-title match. April 4, 2016 – RAW: WWE tag team champions the New Day defeated Sheamus and King Barrett in a non title match. June 6, 2016 – RAW: The Club (AJ Styles, Karl Anderson and Luke Gallows) defeated The New Day (Big E and Kofi Kingston) in a handicap match. July 24, 2016 – Battleground: The Wyatt Family (Braun Strowman, Bray Wyatt and Erick Rowan) defeated The New Day (Big E, Kofi Kingston and Xavier Woods). August 1, 2016 – RAW: The New Day (Big E and Kofi Kingston) defeated The Club (Karl Anderson and Luke Gallows). August 28, 2016 – Live Event: Big E and Kofi Kingston defeated Luke Gallows and Karl Anderson to retain the tag titles. January 29, 2017 – Royal Rumble: Each New Day members participated in the Royal Rumble match won by Randy Orton. January 28, 2018 – Royal Rumble: All 3 members were in the Royal Rumble match in which Shinsuke Nakamura won. February 12, 2018 – Live Event: The New Day (Big E, Kofi Kingston and Xavier Woods) defeated Dolph Ziggler, Mojo Rawley and Primo Colon. February 13, 2018 – SmackDown Live: The New Day (Big E and Kofi Kingston) w Xavier Woods defeated Chad Gable and Shelton Benjamin. February 17-18, 2018 – Live Event: The Usos (Jey Uso and Jimmy Uso) defeated Chad Gable and Shelton Benjamin, The Bludgeon Brothers (Harper & Rowan) & The New Day (Big E and Kofi Kingston) in a fatal 4-way tag team match to retain the tag titles. April 27, 2018 – Greatest Royal Rumble: Kofi Kingston entered the Royal Rumble match at #9 but was won by Braun Strowman. December 2, 2018 – Live Event: Rey Mysterio & The New Day (Big E and Kofi Kingston) defeated Shinsuke Nakamura & The Colons (Epico Colon and Primo Colon). January 27, 2019 – Royal Rumble: Each New Day Members entered the Royal Rumble but was won by Seth Rollins. February 4, 2019 – Live Event: The New Day (Big E and Kofi Kingston) defeated SAnitY (Alexander Wolfe and Eric Young). February 9-11, 2019 – Live Event: Rusev and Shinsuke Nakamura defeated The New Day (Big E and Kofi Kingston) & The Usos (Jey Uso and Jimmy Uso) in a 3-way tag team match. February 18, 2019 – Live Event: The Usos (Jey Uso and Jimmy Uso) defeated The New Day (Big E and Kofi Kingston) & Rusev and Shinsuke Nakamura in a 3-way tag team match to retain the tag team titles. February 23-24, 2019 – Live Event: The Usos (Jey Uso and Jimmy Uso) defeated The New Day (Big E and Kofi Kingston) & Rusev and Shinsuke Nakamura in a 3-way tag team match to retain the tag team titles. February 25, 2019 – Live Event: The Usos (Jey Uso and Jimmy Uso) defeated The New Day (Kofi Kingston and Xavier Woods) w Big E & Rusev and Shinsuke Nakamura in a 3-way tag team match to retain the tag team titles. February 26, 2019 – SmackDown Live: Kevin Owens and Kofi Kingston defeated Daniel Bryan and Rowan. March 9, 2019 – Live Event: The New Day (Big E and Kofi Kingston) defeated Rusev and Shinsuke Nakamura & The Bar (Cesaro & Sheamus) in a 3-way tag team match. March 16, 2019 – Live Event: The New Day (Big E and Kofi Kingston) defeated SAnitY (Alexander Wolfe and Eric Young). March 17, 2019 – Live Event: New Day (Big E and Kofi Kingston) defeated SAnitY (Alexander Wolfe and Killian Dain). March 19, 2019 – SmackDown Live: WWE champion Daniel Bryan defeated Cesaro and Kofi Kingston and Randy Orton and Rowan and Samoa Joe and Sheamus in a non-title, gauntlet match. March 25, 2019 – Live Event: Big E defeated Eric Young.